I decided that as I’ve been putting a little bit of cash away each month in a Christmas Club, part of my treat for myself would be to subscribe to the Boudoir Privé Monthly Beauty Box. I’m not big on fashion (as anyone who knows me can tell), though I do like my fancy makeup. I’m a creature of habit, quite happily stuck in my Clarins land, though do like to try other things, and quite frankly, I deserve a treat – it hasn’t been the greatest year. This was also inspired by Mummy vs Work, and her review of Glossybox. I did weigh up whether I’d be a Boudoir Privé or a Glossybox kind of girl, and after reading lots of reviews, I think as I’m a bit older, BP may be more me. We’ll see… You pay £10 a month (though this price has now gone up to include postage & packing), and you get a box full of surprises each month. My first box has just arrived – and ooh, it’s all in the presentation! It’s small enough the postman brings it (rather than a van), even though it wont fit through the letterbox. It’s packaged in a good strong outer card box, with a pretty pink inner, all lovingly wrapped and sealed with a card and ribbon, with information (and prices) on the samples you’ve received. This month’s box contained Dead Sea Spa Magic – Silky Smooth Body Lotion 50ml, Korres Wild Rose 24 Hour Moisturiser 10ml, Rahua Voluminous Shampoo and Conditioner (two 10ml & 8ml sachets in a nice organza bag), Vinies Ayurveda’s Soul Luminous Skin Mask (two 15gm pots) and Studiomakeup’s Rich Hydration Lipstick 4g (full sized!). On the card you’ve prices to buy this stuff – and the lipstick alone is £12.25. Given the box was £10, I’ve already gained… (the skin mask is £32.85 for 40gm – crazy prices, potentially I’ll have amazing skin!) – these are properly lovely cosmetics, a treat, and something I’ll be making sure I save for a good pamper occasion (rather than just everyday). I’m really looking forward to next months box – these aren’t brands I’d be splashing out on normally so I’m quite enjoying this treat…. would I buy these after sampling them? If they’re comparable in price and quality to my Clarins love-in, then maybe..
Phew, another Baby Show, another weekend of chaos, but at least this time it’s near the sea, so you can breathe. Add to this the weather was amazing, and we had to do it. I’d never been to the AMEX Stadium, though knew roughly where to head – and after a while wondered if I’d got it wrong, and whether it’d be obvious to see where we turn off; there were no signs, but eventually the stadium was pretty easy to spot. We queued and got checked in, and once the doors opened we were ushered through quickly. This was good, however, the biggest downside with the new venue (last year it was at the Racecourse) was that you couldn’t get from one side to the other if you had a buggy – you had to leave the venue. Actually, I lie, that wasn’t the biggest downside – that was not being able to get a phone signal inside the main areas! A lot of the traders were having problems with this too, and at one point one trader had to walk over the other side of the room for his card machine to connect – it worked though. Anyway, I’m not here to moan, I’m here to tell you about more companies that we met and saw their nice things.. so read on. Flyer-wise, we got some good ones – Toy Rentals – brilliant idea (although I am the world’s worst at returning library books, or LoveFilm DVD’s) – check out http://www.toyrentals.co.uk – it’s set to launch in January 2012. Brighton has a new destination for children’s grooming, haircuts, pampering, parties and shopping – hello Bertie & Belle – head over to http://www.bertieandbelle.co.uk for more information – it opens on December 10th 2011. Onwards to the excellent products and traders we saw and met – BundleBean was there and looked really busy – have you bought one yet? Have you read my gushing about them yet? Should I gush more…? With the weather so mild right now, our BundleBean is getting a lot of use. One that interested me a lot was a sample of ‘Dry Like Me‘ – a pad which would go into a pair of pants, while potty training. I’m working on a feature about potty training – if you’ve got this far, then do pop over to the Mum Friendly Facebook Group (if you’re on there) and let us know your tips if you have any – so many people do so many different things, and there’s so many things out there! I think this is an excellent idea, though I didn’t find their stand, unfortunately. However, I love samples of things and being able to try them out – so I’ll definitely try this one! http://www.drylikeme.com – you can register to test things on their site too – worth doing! All in all it was a good baby show – loads of stalls all packed into a better sized area than last year – and even better, lots of information for local groups and activities – something which I’m sure Brighton isn’t short of. H got to meet Mister Maker “I was a little bit shy, I didn’t talk to him” she said after she’d had her photo taken with him – even though she’d been having pretend conversations on her Makka Pakka phone all the way down in the car with him. Aaah, toddlers. There’s some great stuff linked above – please take the time to visit them – they’re all lovely. The lovely people at Entertainment One have given us some DVDs for a giveaway, there’s two Humf titles, and one Peppa Pig. If you’d like to try win these, we’d love you to do a couple of things. Mum Friendly is about sharing information about places that you’d tell your mum friends – please submit a review (you don’t have to create an account to do this). If you’re on Facebook, are you signed up to the Mum Friendly Page and Group? Please post on your wall the following “I just entered @Mum Friendly’s Competition to win some DVD Goodies – head over to https://www.mum-friendly.co.uk/content/nov-comp” and if you can get any friends to join the group, consider it an additional entry. If they place a review too, then there’s a third. So there’s four chances to win some lovely DVDs just in time for Christmas. Please leave a comment to this entry, and each entry will be allocated a number. In the interest of fairness, Holly will pick a number from Tiny Tears’ Sleeping Bag on the 1st December 2011 (at around 5pm), and I’ll announce the winner that evening! If you’ve not met Humf, let me tell you more. He’s a three year old furry thing, short and round and purple and cuddly and the stories are all charming – all narrated by Caroline Quentin too. Here’s a brief from Wikipedia as an episode summary “In general, plots are centred around Humf and his exploration of the world. An example would be when Humf and his friends go to the park and see litter on the floor. They discuss it and then start to pick it up and put it in the bin with increasing vigour. Humf’s mum inturrupts when he goes to pick up a banana skin and explains that to be safe they should not attempt to pick up all litter as some is yucky.” It’s all quite charming stuff, and you’ll be singing the theme before you know it… The two DVDs are ‘Humf and the Big Boots’ (includes two bonus episodes), and ‘Humf and the Fluffy Thing’ (which includes a bonus disc with six more episodes!). Does Peppa Pig really need any introduction? Peppa is a loveable, cheeky little piggy who lives with her younger brother George, Mummy Pig and Daddy Pig. This DVD is ‘Princess Peppa and Sir George The Brave’ – and if you’re a Ben and Holly fan, then there’s also an exclusive episode included on the DVD – ‘The Frog Prince’. This DVD dates back to 2009, so it may well have been broadcast – but we love them all, so it’s a good bonus! Peppa episodes include ‘Rainbow’, ‘Princess Peppa’, ‘The Camper Van’, ‘Work and Play’ – there’s ten in total. Congratulations to Charlotte at Mummy Fever who won – we missed Saturday’s post, so the DVDs will be on their way to you next week! Having a two year old means stopping for a coffee can be a difficult task if there’s no incentive for them. Fortunately H’s incentive is a “cup of coffee” which Grazie Mille in Carshalton serves just perfectly for her – in a proper cup, frothy slightly warmed milk with some chocolate on the top. She’s happy and I’m happy, and the cafe is (probably) happy as she can get fidgety at times – there’s space for buggies (to the counter, and storage-wise), we’ve already been twice in the last week. Highly recommended if you’re in the area, anyway, and everyone there is so friendly! We were extremely lucky to be sent a preview DVD plus Backpack goody pack for the new Dora The Explorer adventures, which are set to be shown on Nick Jr next week. 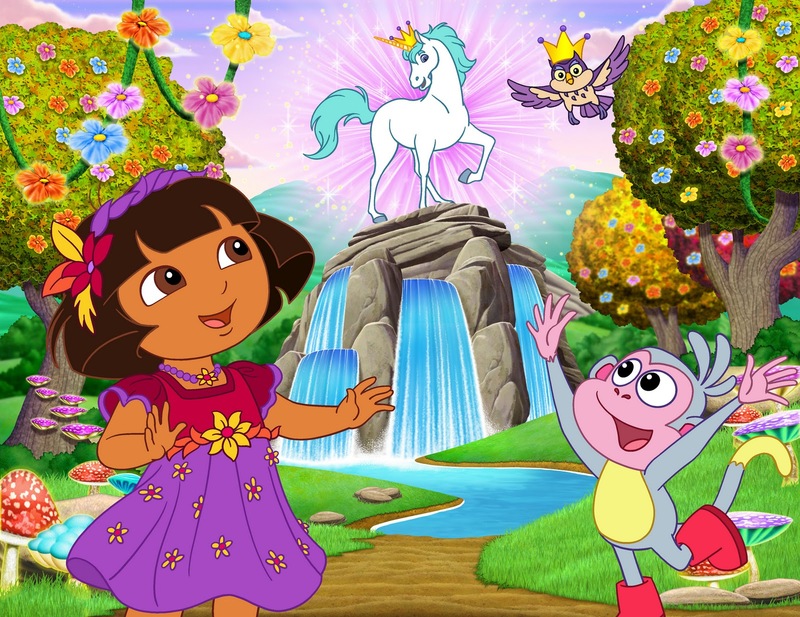 Dora’s Enchanted Forest Adventures are a three part adventure with an hour long finale – which starts on Tuesday 8th November at 4.30pm, continuing on Wednesday at 4.30pm and the finale on Thursday, again at 4.30pm. All episodes are repeated each night at 6.30pm. Dora’s Enchanted Forest Adventures starts on Tuesday 8th November at 4.30pm…only on Nick Jr. (Sky 615, Virgin 715 and TalkTalk 318). In the week of the show there will also be Enchanted Forest games, drawing activities and clips all related to these specials. We’ll add a Mum Friendly review very very soon! It’s an issue most of my friends have come across (including those without kids) – which blackout blind to use? So here’s a few we use, or have recently come across… read on. At The Baby Show for Trade recently I caught the Magic Blackout Blind which attaches itself to your window via static – it looks great, is tidy, and is something I’d definitely consider. They featured on Dragon’s Den too! In our room we have an Ikea blackout blind, which are quite reasonable in price, and do the job, though light does creep in around the sides. The cord also needs to be fixed to the wall, as it’s a toddler hazard… H managed to pull one off the wall within a week. Fortunately Ikea gave me a free replacement. Lightsoutblinds are a new company, and I’m liking how their blinds fit – from the side, so you can open your windows. They work using suction pads (as the Gro one does), which tighten – they’ll be at The Baby Show this coming weekend, so if anyone gets to see them, report back please! Find them over here – Lights Out Portable Blackout Blind. So what do you use? Does it work? Comment below, and let us know! H is only just two, so only just entering into the world of Dora the Explorer – so we’re all learning as we go along. What I have to say, most of all, is I love how we get dialogue in spanish and english – we’ve both been teaching bits of french to H, so we’re all learning random words (and bits that crop up in Nick Jr trailers). So, Dora’s Ballet Adventure – H has a fairly low attention span, and usually gets bored around 15 minutes into longer programmes – but we found with this one that the characters all have their own individual parts (the map, for example) that there was enough going on we were able to sit and watch in one sitting – plus Dora getting the shoes and getting back again had plenty of different things happening. The songs are catchy, and simple and repetitive – which is perfect for H as she picks things up straight away at the moment. The story was easy to follow, and the dialogue not too complicated – even the spanish bits. There were plenty of interactive sections which H joined in on, and Dora would reply (obviously on the review DVD we were sent, so an appropriate gap is left) – which in turn made her feel a part of it. The Baby and Toddler Show for Traders, Olympia, 2011. Next to Cheeky Wipes was a stall Naturally Cool Kids, who I’d never heard of – but do five really simple products, and they’re all really good – plus they’re all natural and not tested on animals. After a good chat we came away with a sample of their menthol cool stick (which we’ve rubbed on H’s feet, then covered with socks and it’s worked a treat, stopping her from coughing all night) – they’ve got a nice cream which works as a barrier for dribbles and chapped noses too – I like. I will be buying from there soon…! Excitingly, Baba Me, who are based in Belfast had a stand – and had a really prominent Bum Genius display. Our first reusable nappies were Bum Genius, and I’ve always been pleased with them – though we tend to use disposables more these days, unfortunately. What caught my eye was they’re about to launch (well, in January 2012) some reusable toilet training pants – with elasticated sides (in a different colour), and three different sizes (three sets of poppers/buttons – I can’t remember which), as well as three liners – so you can use the same set of pants three times. I’m liking this a lot… that could potentially be a pair of them (six liners in total) for H for nursery, for example as and when we do potty training – the liners are designed so your little one can feel they’re wet, but are designed to be removed and replaced with another liner, without getting rid of the outer. I approve! We were pushed for time, so headed upstairs – where I saw a stand for Baby Swap Or Shop which is an excellent site and idea, but they were busy. We skipped the buggy section, due to lack of time, but saw the Strider Rider stand – and finally got to see one of the bikes properly – oh they’re good – and really nice and sturdy too. The Strider UK people have just been in the US checking out some new bikes that are to be added to the range in the near future – don’t forget, if you were thinking about buying one, then there’s a Mum Friendly discount – check our discounts tab. We had a brief stop at the BuggyTug stand, where the strap which they’ve had a while is getting an update – there’s now three in one, The TugTrio – and all for £9.99. You get a wrist strap which can be attached to a buggy – great for wandering toddlers who aren’t keen on backpacks but like to help push – the Buggy Tug, which connects the parent to the pram, and a Teddy Tug which connects a favourite teddy or toy to the pram. We found the BundleBean stand – and introduced ourselves – the BundleBean is great – H even announced “that’s mine!” when she saw it – and an excerpt of my review on The Baby Website is now on their stand display! The BundleBean is something I wish I’d had a long time ago, and was perfect for the day we were out – Olympia was really warm, outside was chilly, and I had a toddler who needed a nap – and it did the trick in keeping her warm (but she got too excited about the train to actually have that nap) – check out BundleBean – they’re in lots of stores up and down the country, I’ll try not to gush too much, it’s an excellent idea. After BundleBean, next door was the Hamster Pannier Buggy Bags stand – I’ve always been intrigued by them as it’s a good idea – plus they give your buggy more stability (something I need when I do the shopping…), and seeing them in person, they make so much sense – and are really easy to put onto the buggy and take off. I wish I could have stayed there for longer, but we had to get back. Our last stop was at Music For Baby – they make CD’s and they’re distributed the regular way, as well as being available digitally – including Spotify. There’s various versions of nursery rhymes done in different genres – their most current one being jazz versions of the songs. It’s done really well too – one that I like the sound of and will have a proper listen to is lots of percussion – the CD’s are all made with preschoolers in mind – and most of all, fun! The people involved have a good musical background too – they know what they’re doing, they’re really friendly and nice, and with the music on Spotify you can try before you buy – what’s to lose? We were waiting at Clapham Junction and I got chatting to another mum who had been at the show. Ends up she’s a director for the company Olive & Moss – and they do some gorgeous baby and toddler clothes – plus they illustrate books and cards – it’s all really really lovely stuff. Break out your dancing shoes because Dora the Explorer’s dance class is having a big show! In this brand new special Dora Ballet Adventure, Dora is opening the ballet show and she can’t wait for her family to see her perform. She just needs her dance slippers, but by mistake the Delivery Duck has brought scuba flippers instead! The show can’t start without the slippers. Can Boots help Dora find a pair of dance slippers and save the show?